Peter Sutherland was born on 25 April 1946 and was educated at Gonzaga College, University College Dublin, and at the Honourable Society of the Kings Inns, Dublin. Of Irish nationality, Mr. Sutherland graduated in Civil Law and was admitted to the Irish Bar (Kings Inns), the English Bar (Middle Temple) and the New York Bar. He was also admitted to practice before the Supreme Court of the United States of America. From 1969 to 1981, he practised at the Bar, and thereafter served as the Attorney General of Ireland and as a Member of the Council of State until the end of 1984 when he was nominated by the Government of Ireland as a Commissioner of the European Communities. From 1985 to 1989, he served in Brussels as the Commissioner responsible for Competition Policy. During this period, his other Commission dossiers were Social Affairs, Education and Relations with the European Parliament. During the period from 1989 to 1993 he was Chairman of Allied Irish Banks and was a member of the Boards of a number of other companies. 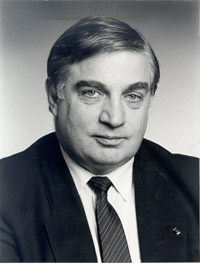 Peter Sutherland became Director-General of the World Trade Organization on 1 January 1995. He had previously served as Director-General of GATT since 1 July 1993. In 1989, he was the Heffernan Visiting Fellow at the Kennedy School of Government at Harvard University. His current academic posts include Visiting Professor at University College, Dublin, and Distinguished Visiting Fellow at the Centre for European Policy Studies, Brussels. He has received honorary degrees from the National University of Ireland, St. Louis University, Dublin City University, Holy Cross University (Mass. USA). In 1988, he was the first EC Commissioner to receive the Gold Medal of the European Parliament. His other awards include the First European Law Prize (Paris 1988), the Grand Cross of Civil Merit (Spain 1989), and the Grand Cross of King Leopold II (Belgium 1989), the New Zealand Commemorative Medal (1990), Chevalier de la Legion dHonneur (France 1993), and Commandeur du Wissam (Morocco 1994). His publications include the book "Premier Janvier 1993 ce qui va changer en Europe" (1989), and numerous articles in law journals. He is married and has three children, and his leisure interests include reading and sport. Mr Sutherland passed away on 7 January 2018.